DayZ isn't quite its own game. 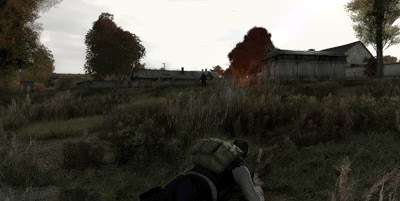 It's in fact a free mod for military shooter ArmA II, developed by Czech studio Bohemia Interactive. But DayZ has transcended its source game as an internet phenomenon, a persistent-world permanent-death zombie shooter MMO with a colossal following. You can download it here, although it requires a copy of the (not free) ArmA II to play. Creator Dean "Rocket" Hall worked on the concept for DayZ while serving in the New Zealand army, "as a suggestion for training soldiers through exposure to situations provoking emotion and relevant thought processes." At first I wanted to overlook DayZ as another entry in the over-saturated zombie fad of recent years, but its focus on emergent gameplay and permadeath made me realize it's probably one of the most important videogames of this decade. Hall announced in August that he would work together with ArmA's original developer Bohemia to work on a standalone DayZ game, slated for release sometime this year. If it's anything like Counter-Strike or Dear Esther's transitions from mods to full products, it should be revolutionary.